The Seventh International Festival of the Sahara Desert Music in Errachida is an artistic event inspired by the music and magic of Morocco took place on September 26th – 27th, 2009. This annual Moroccan event seeks to preserve authentic values and showcase North African cultural heritage as well as highlight the magnificent scenery of the Moroccan Sahara desert. Errachidia, in the south-western part of Morocco, becomes a tourist magnet during the annual Desert Music Festival. As well as promoting peace and dialogue between cultures, the festival features music from the world, attracting many notable performers. The 2008 Desert Music Festival included well-known Moroccan and foreign artists such as Jolf Art (Senegal), Arion (Greece) and others from Algeria, Sudan, Egypt, Saudi Arabia, Chile and Mali. 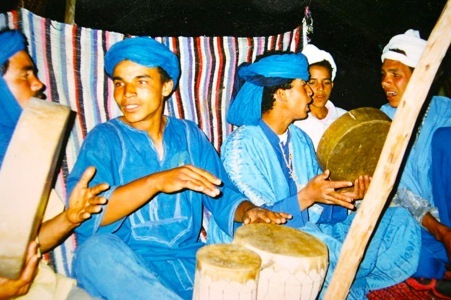 The International Festival of the Sahara in previous years staged shows as open-air spectacles on the oases of Merzouga, Ksar El Fida, Rissani and Erfoud. To allow a greater number of Moroccan travelers from abroad, the future festival performances will be held in Errachidia, Rissani and the Imperial City of Meknes. The International Festival of the Sahara in previous years staged shows as open-air spectacles on the oases of Merzouga, Ksar El Fida, Rissani and Erfoud. To allow a greater number of Moroccan travelers from abroad, the future festival performances will be held in Errachidia, Rissani and the Imperial City of Meknes. You are currently browsing the archives for the Errachidia Morocco Festival category.